The Fairest Run of All: In Which Jenn Is Running MCM After All - Will You Help? In Which Jenn Is Running MCM After All - Will You Help? I didn't think I was gonna do it this year. I didn't feel like going through the training process. So I didn't enter the lottery. First I saw blog posts from a bunch of my friends who had signed up... and felt pangs of jealousy. Then I had a long discussion with Moon about marathon possibilities. And before I knew it, I was scouring the internet for charity bibs. All of this to say: I am proud to be running the 40th Annual Marine Corps Marathon as part of the Diabetes Action Team. I considered other charities, some of which required smaller minimum funds raised - but diabetes was a major player in my maternal grandfather's death, and DAT gives me the opportunity to run in his memory. 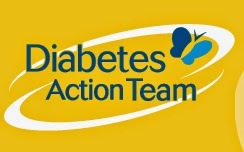 To earn my bib, I need to raise a minimum of $500 for the Diabetes Action Research & Education Foundation. Will you donate to the cause? Every little bit counts! The donation is tax deductible, and the money goes to a good cause. Even a single dollar will get me closer! Click here to donate. So yeah! Here I am, back on the road to MCM. Who will I see out on the course? ANOTHER SUMMERTIME THURSDAY NIGHT LONG-ISH RUN?! CLEARLY. Also, I am trying to get info about that 20 mile race, but it looks like the might not have opened registration yet; they still have last year's registration page up.